8 Essential Tips for Planning Your Outdoor Living Area! Looking to transform your yard? Taking time to thoughtfully plan will help you create the space of your dreams and avoid big regrets! We've arranged these tips in the order we feel will give you the best outcome, but expect you may end up going back and forth between these steps as your creative juices begin to flow. 1. Budget: How much are you willing to spend? It is important for you to establish a project budget with potential contractors. Understandably, customers can feel uncomfortable talking about their budget for fear they’ll get taken advantage of. Overcome this fear by interviewing at least three reputable contractors. This allows you to compare the different designs, quotes and business styles, and make an informed final decision. Ask direct questions regarding cost if you are unsure of an appropriate range to set for your project. If you are upfront about your budget, contractors can usually design a space that fits or recommend a phased plan forward. Contractor Tip: When you get a quote, inquire as to whether it is fixed or an estimate. You don't want to end up at the end of a project with a bill that is much higher than your original quote, only to find out that what you signed was an estimate. 2. Function: Not just what you want, but why? This is easy if you are installing a path or border, but it gets more complicated when it comes to outdoor living spaces. How are you going to use the space? Just for your family, or are you going to be entertaining? If so, how many people do you expect? You'll want to create the right amount of space and seating area. Be sure to consider the age and mobility of your family and close friends. Also, do you prefer separate dining and lounging areas, or do you need to accomplish both in one space? What outdoor furniture you have or plan to buy? Knowing beforehand can really help in determining the best size and shape of your space. 3. Privacy and sun exposure: Do you want privacy from your neighbors? Creating a trellis, or placing landscaping or a fireplace in just the right spot can help with this. You may even want to create a barrier from noisy ac/heating units that are often located in the backyard. If you are looking for a backyard sanctuary, where in your yard would be the most suitable? Close to your home or in a far corner of the property? Also, hardscapes absorb heat in sunlight, so think about reducing the amount of direct light that hits your space. There are a variety of ways to create privacy and shade. Think about your options and then choose the solutions that are best for you and your budget. 4. Grade: Do you have areas where water tends to flow or pool when there is heavy rain? Convey this to professionals you are interviewing. Fortunately, your landscaping project could be part of the solution. Also, keep in mind that your design ideas may need to be adjusted depending on whether you have a relatively flat or sloped yard. Money Saving Tip: When possible, customizing the design to suit the slope of your yard is a great way to save money! Rather than spending your budget on large retaining walls, work with your grade, this will free you to invest in elements that give the most enjoyment and visual impact; such as stone steps, outdoor lighting and landscaping. Work with your land not against it! 5. Style: The fun part! Do you prefer a formal or natural look? Traditional, contemporary, farmhouse modern or rustic . . . Houzz.com is the perfect place to discover your style, but anything goes. Set up ideabooks, bookmark pages, take photos or even cut out magazine pictures you like. Even if the photo it isn't exactly what you want, let potential contractors know what about it appeals to you (i.e. the material, layout, a certain element, the style etc.). This will assist them in designing a space that best suits your style. Take into consideration your home style and other structures, paths and landscaping on your property, so that your new space looks like it belongs, rather than clashes, with the other elements. 6. Materials: This is closely related to style, but deserves to stand on it's own due to the importance of getting them right. Material continuity is key to establishing that “just right” feel in your new space - so take a look around. What materials were used in the exterior/interior of your home and other outdoor structures/elements on your property. It is recommended to "tie-in" existing materials in some form or another. For example, if your home is brick, but you love stone, continuity could be accomplished through a matching brick accent in a predominantly stone fireplace. Or choose a paver color that compliments the color of the stone, brick or paint on your home. Remember, more expensive material, doesn't necessarily make it better, it's more important to choose a materials that compliment the other materials on your property and in your project. Design Tip: Limit the palette of material choices to prevent your yard from looking hodgepodge. 7. Brainstorm: Keep an open mind as you explore options. Professional contractors make their living working with project designs and materials. Put that experience to work for you! Ask for their opinion and ideas after you’ve shared yours. They can give you valuable insight - often for free. Also, if the cost for your dream space is more than you want to spend, ask for suggestions to help cut costs or accomplish your project in stages. 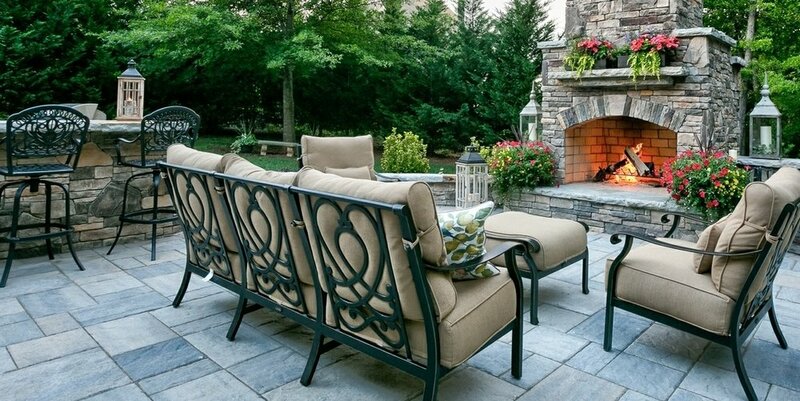 At times, it is necessary to take a step back and prioritize, or make tough decisions, like dropping the fireplace, and substituting it with a fire pit, so you still have a fire feature, but also have the budget to include outdoor lighting and landscaping to complete your space. Also consider a phased approach if you can’t have it all in one go; what do you need now and what can be added in the future as your budget allows. 8. Hiring: Hiring a contractor doesn’t need to be daunting. Ask friends and coworkers for recommendations, but don’t hire your friends or family as this can cause a world of trouble. Only trust confirmed customer reviews! Unfortunately, companies can “hire” reviewers to generate positive reviews for them on some of the most "trusted" review sites. We recommend using Houzz and Angie’s List for REAL customer reviews since they have a confirmation process to help prevent companies from doing this. Also, ask for recent customer references, then call them. Visit projects in process, or check out completed project photos. This legwork will help you know if the contractor you are considering can deliver the experience and space that you want. As design and build professionals, we know taking time to plan is essential to achieving the outdoor living space of your dreams. This step is too important to skip. Just do it! You'll see that the planning stage can be fun, inspiring and invaluable. No matter who you choose to hire for your project, we sincerely hope these tips help you as you plan and construct your very own special outdoor space. Press Release: Outdoor Artisan earns 2015 Angie's List Super Service Award! Outdoor Artisan has earned the service industry’s coveted Angie’s List Super Service Award in six categories this year! This reflects an exemplary year of service provided to members of the local services marketplace and consumer review site in 2015. Thank you and then some! We at Outdoor Artisan are so grateful for our customers. Truly, we have been blessed with the best! Not only have each of you been a pleasure to work with, but thanks to your reviews we received a Super Service award from Angie's List for 2013. This is a big honor and really quite an accomplishment since last year was our first full year in business for ourselves. When we established Outdoor Artisan, we decided not to put big bucks into advertising in magazines or paying thousands to be involved in home shows. In fact, we didn't have that kind of money to spare without charging our customers more. So we simply hoped that our work and our reputation would speak for itself and generate more work. Thanks to you that is exactly what has happened. Because of your reviews and recommendations to friends, family and coworkers we now have so much work! This is the best problem a company can ask for. However, since we are in the business of solutions and we don't want to make our customers wait for months on end we have decided to expand by hiring more quality guys. Soon we will get their pictures up with a little bio, but first we want to just introduce these fine men who we have chosen because, like us, they care: about our customers, our projects and our reputation as a company. Welcome Randy Sandford. A good friend, experienced contractor, and former coworker in the stone industry. We are thrilled to have him with us since he brings extensive design, sales and project oversight experience, plus he is just a really great guy! He will be doing a lot of the same work Clive does; managing projects from that first consultation, design and quote through to project completion. Welcome Corey our new crew leader. He has been in this business for over ten years, running his own company for much of that, but willing to join us in order to get out of the office and back on actual project work that he has a real passion for. We welcome Daniel Hall. Okay, full disclosure, he is family (1st cousin) but don't worry he has more than earned his place on our team. Daniel works so hard even our crews have commented on his work ethic. He has been promoted to handling deliveries, machine and tool maintenance and general logistics. Often, he will be the one showing up at the beginning and end of projects to get things started and to wrap them up. He is an amazingly competent guy to have on our team. Thank you once again to all our customers for choosing Outdoor Artisan. Without your projects, your reviews and your recommendations we wouldn't be in business let alone growing. It is our goal to continue to give each of our customers an experience that exceeds their expectations. This "before photo" is the yard of a potential client who called us at the recommendation of a friend. They wanted concept design of a patio and small water feature. Would you like to know what to expect if you hired us for your project? Please read on for an overview of the general process of working with Outdoor Artisan from start to finish (The OA way). Once you contact us we will set up a free consultation for a time that is convenient for you. During that first appointment, we listen . . . to your dreams, ideas and concerns for your yard. We'll then provide you with an original design based on your desires and our professional experience. If you love the design and want to move forward to the next step, we will give you a quote that you can count on. This is not an estimate! It is a promise that we will complete your project for the amount that we have quoted. This is very important to us. We want you to be able to relax and enjoy the whole creative process, knowing that there won't be any cost surprises in the final bill. If you choose to add work or change materials, no problem, we will provide you with another quote for that. After reviewing the details, if you decide that we are the company to create your hardscape, simply sign the quote. We will add you to our project schedule and give you an estimated start date. At this time, we usually require a scheduling deposit for $500. We will strive to get your job started on the scheduled date, however sometimes there are unforeseen delays mostly due to weather conditions. Just before we begin, your materials will start arriving. We will call beforehand to let you know to expect the deliveries and to confirm where you would like them placed. On the first day of your project, Clive will arrive with the crew, mark out the dimensions and they will begin working. Very exciting! Less exciting, but necessary, Clive will also collect the materials deposit. The materials deposit is normally 50% of the total job cost and can be paid with a personal check. Once we are on your job it is our #1 priority. Clive will stay in touch with you throughout the project to keep you updated, answer any questions and make sure you are happy with the progress. Your hardscape will be installed correctly and with excellence. You can expect us to stay on your job until it is finished and to have it completed in as few days as possible while still maintaining the highest standards during the installation. When your hardscape is complete and your yard restored to order, Clive will meet with you to make sure that you are 100% satisfied. If you are (and we have every reason to expect that you will be) Clive will collect the final payment and leave you to enjoy your very own hardscape for years and years to come. It's like cleaning out your closet . . .
Having a hardscape installed in your yard is very exciting. After all, we are literally making your dreams come true (well for your yard anyway) and you can see it taking place right before your eyes. Thrilling! However, we do want to warn you of a necessary evil along the way - excavation. We are pretty sure there is a moment in most of our projects, when our clients take a peek out their window, and think "What have I done!!!" Their perfect lawn (or even if it wasn't so perfect) is gone. Huge areas of grass have been ripped up, torn out, and now lie in piles, never to return again. Add to this, numerous pallets of stone, pavers and other materials that will be placed close by, ready to be part of your new creation. It will look a whole lot more like a war zone than your dream come true! But take heart, a breath, and then a few pictures. Remember, this excavation stage is brief. We like to tell people that excavation is just like cleaning out your closet. Everything looks so much worse before it can get so much better. Please do take lots of photos. We would love it if you send them to us so we can post them here to encourage and reassure folks who are going through this stage. Oh yes, please be sure to include the after photos too!